This page is about the anatomy concept. For other uses, see Chest (disambiguation). "Chest" redirects here. For the furniture used for storage, see Chest (furniture). For other uses, see Chest (disambiguation). 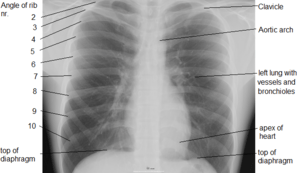 X-ray image of the chest showing the internal anatomy of the rib cage, lungs and heart as well as the inferior thoracic border–made up of the diaphragm. The thorax or chest (from the Greek θώραξ thorax "breastplate, cuirass, corslet" via Latin: thorax) is a part of the anatomy of humans and various other animals located between the neck and the abdomen. The thorax includes the thoracic cavity and the thoracic wall. It contains organs including the heart, lungs, and thymus gland, as well as muscles and various other internal structures. Many diseases may affect the chest, and one of the most common symptoms is chest pain. In humans and other hominids, the thorax is the chest region of the body between the neck and the abdomen, along with its internal organs and other contents. It is mostly protected and supported by the rib cage, spine, and shoulder girdle. The contents of the thorax include the heart and lungs and the thymus gland); the (major and minor pectoral muscles, trapezius muscles and neck muscle); internal structures such as the diaphragm, esophagus, trachea and a part of the sternum known as the xiphoid process), as well as the content of the thoracic abdomen (stomach, kidney/adrenal, pancreas, spleen, and lower oesophagus). Arteries and veins are also contained – (aorta, superior vena cava, inferior vena cava and the pulmonary artery); bones (the shoulder socket containing the upper part of the humerus, the scapula, sternum, thoracic portion of the spine, collarbone, and the rib cage and floating ribs). In the human body, the region of the thorax between the neck and diaphragm in the front of the body is called the chest. The corresponding area in an animal can also be referred to as the chest. The bones of the thorax, called the "thoracic skeleton" is a component of the axial skeleton. 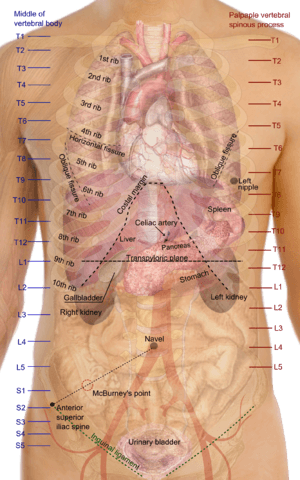 It consists of the ribs and sternum.The ribs of the thorax are numbered in ascending order from 1-12. 11 & 12 are known as floating ribs. Different types of diseases or conditions that affect the chest include pleurisy, flail chest, atelectasis, and the most common condition, chest pain. These conditions can be hereditary or caused by birth defects or trauma. Any condition that lowers the ability to either breathe deeply or to cough is considered a chest disease or condition. Injury to the chest (also referred to as chest trauma, thoracic injury, or thoracic trauma) results in up to ¼ of all deaths due to trauma in the United States. The major pathophysiologies encountered in blunt chest trauma involve derangements in the flow of air, blood, or both in combination. Sepsis due to leakage of alimentary tract contents, as in esophageal perforations, also must be considered. Blunt trauma commonly results in chest wall injuries (e.g., rib fractures). The pain associated with these injuries can make breathing difficult, and this may compromise ventilation. 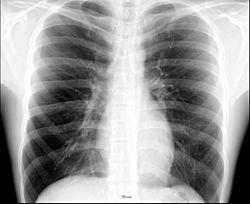 Direct lung injuries, such as pulmonary contusions (see the image below), are frequently associated with major chest trauma and may impair ventilation by a similar mechanism. Chest pain can be the result of multiple issues including respiratory problems, digestive issues, musculoskeletal complications. The pain can trigger cardiac issues as well. Not all pain that is felt is associated with the heart, but it should not be taken lightly either. Symptoms can be different depending on the cause of the pain. While cardiac issues cause feelings of sudden pressure in the chest or a crushing pain in the back, neck and arms, pain that is felt due to non cardiac issues gives a burning feeling along the digestive tract or pain when deep breaths are attempted. Different people feel pains differently for the same condition. Only a patient truly knows if the symptoms are mild or serious. Just like with a heart attack, not all chest pain is suffered because of a condition involving the heart. Chest wall pain can be experienced after an increase in activity. Persons who add exercise to their daily routine generally feel this type of pain at the beginning. It is important to monitor the pain to ensure that it is not a sign of something more serious. Pain can also be experienced in persons who have an upper respiratory infection. This virus is also accompanied by fever and cough. Shingles is another viral infection that can give symptoms of chest or rib pain before a rash develops. Injuries to the rib cage or sternum is also a common cause of chest pain. It is generally felt when deep breaths are taken or during cough. Chest Facts for Kids. Kiddle Encyclopedia.